It’s that time of year kids! I had a zillion emails asking me where this post was. NOTE FOLKS! You can always use the Lijit search engine you see in the right side bar to search this blog, my friends blogs and all my on line content for stuff. Who's thinking cyclocross! I am! I am! In fact, I never stop thinking about it. I just watched the 2000 Worlds again for the zillionth time last night. Love watching Groovy-daal work the mud. In other words, I watch and study 'cross as an obsession. Rewinding again and again and again to see how Ik Sven takes a line with insanely low tire pressure in the Dugasts; *or* how Erwin ports the bike Belgie style, finessing the bike on to his shoulder and arm around the head tube in such syncopation you need to see it in slow motion; *or* how De Clercq stutter steps his muddy climbs to conserve energy. It's all in the details and that's where cross races are won and lost. So, what makes a cross rider great? Technical savvy. I love putting pain to roadies who fumble through 'cross courses like a deer trying to walk across ice. 'Cross, if you haven't figured it out yet, is a game of not only sheer maintenance of power but also of utter grace. The power keeps you at the front but the grace ensures it is damn near impossible to bridge to you. Technical savvy off the bike is what makes the best cross riders the best. And to be specific, it's the barriers that above all are the bottleneck and gating factor (no pun intended) to those desiring a podium spot. When you can flow effortlessly through the barriers and reduce all amounts of friction through your transition and get back on the bike fluidly, folks without those same skills fumble, waste energy and when they finally remount and get going again, they have to add those additional watts of power to get back on your wheel. Compound that wattage expenditure over the course of 60 minutes and those without your barrier skills have burned WAY too many matches. So, how do you get better? Practice, dummy. And to practice you need barriers. Back in the day, we used to drive our cars to a schoolyard and pull out wooden boards we'd made. That is retarded, and this will enable you to be mobile by bike, carry 'em in a back pack and have LOTS of barriers as well to set up multiples. So in my quest to make American 'crossers LOOK way better than our stereotypical bumbling selves, behold my secret plans. 16 22" sections of 1/2" PVC tubing (for the top bars). 16 18" sections of same 1/2" PVC tubing (for the legs). NOTE: you may want to go as high as 19" for a bit more height on the leg tubes. The 18" tubes are high but just slightly lower than the UCI height. I bought all this stuff at the local hardware store for like $20 bucks. I had them cut it there into the section lengths specified above. This is what the 2 and 3 way sections look like (the 2 way on the left, 3 way on the right). You can find them near the PVC tube section in your hardware store. Yup, I just built these up this weekend. 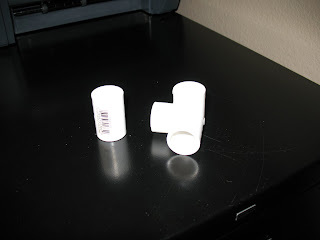 Last year, I had some spare 1 1/2" PVC pipe and decided to use that. Bad idea! Weighed a ton and barely fit in my backpack. So this year, I went with the 1/2". Note: the 3-way fittings are hard to find. None of my local hardware stores carried them, including the irrigation place. So I got the 3-way fittings from ACF Greenhouses. Get a few extra, since they'll stick you $8 for the shipping. Greg, our practices start Thursday night and I've got the PVC barriers ready to rock. Thanks for the idea (last year). They fit nicely into an old folding chair bag that I can carry on the bike to practice. Hup Hup! Great tutorial though! I'm totally going to build some of these this week!